﻿﻿﻿﻿﻿﻿﻿Most restaurants offer tea on their menu. Choices could be from a basic limp bag of Lipton, all the way up to a selection of teas by the pot. If I'm out and the mood strikes, I may order tea if it is a reasonable price and something more than a basic bag of you know what (although if I'm really craving a cup and I'm in a diner, I may get that, too). Some friends have suggested that I bring my own tea bags. But that just seems rude and disrespectful to the restaurant. If I want a cup of tea that badly, I'll order what they have or just wait until later. Every so often I will be surprised by a perfect cup (or pot) while I am out. These experiences are usually few and far between. Just to note, I am talking about restaurants that focus on food, not tea shops, tea houses, or other establishments that actually specialize in tea. Often restaurants will offer bagged tea that could easily be purchased by the box in any store for just a little more than their price for a pot. If it is a tea that I like, I may usually order a pot to support the restaurant's tea service. Perhaps the inflated prices can be be compared to the mark-up on wine. What really bothers me is when a restaurant charges upwards of $6 for a pot of tea, and it's not prepared properly. My husband and I enjoy splurging on a high-end meal now and again. Tea often gets overlooked at these restaurants, but coffee is always of high quality. When asked about a tea selection, 9 times out of 10 the server doesn't know much more than if the tea is black, green, or herbal. When they do offer loose leaves, the teas are not always brewed correctly. 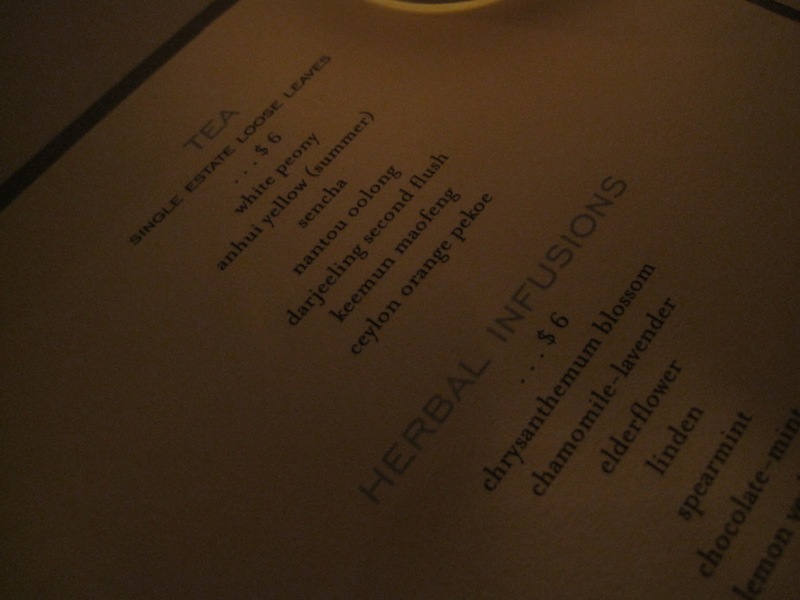 I've had one crazy tea experience at a 4-star NY restaurant. I ordered a 2nd flush Darjeeling (I was excited to see that this restaurant knew enough to say that it was a 2nd flush). The tea arrived in a dainty porcelain pot with all the appropriate accouterments. But when I gave it a taste, it was VERY bitter, and a dark maroon color. I love the full flavor that a 2nd flush Darjeeling allows. They can be a bit strong, but not bitter to the point of undrinkability. When the server came over, I pointed out that the tea was too bitter. He gave me a snooty look and said 'well, it IS a second flush Darjeeling'. Um, thanks fella. I sheepishly told him that I was familiar with this type of tea, and that it was over-steeped. I'm sure he also used too much tea. He let out a huge sigh, and whisked the tea away. When you are paying hundreds of dollars for dinner (I don't remember how much the pot of tea was, but I'm sure it was quite a bit), why would you want poorly prepared tea? Clearly he brewed the tea incorrectly, but didn't want to own up to it. Whatever the case, it is frustrating that coffee gets so much attention at high end restaurants, but teas do not. If a cup of coffee tasted off, it would be fixed without a problem. An exception to this is a recent dinner my husband and I had at Blue Hill at Stone Barns. They have a separate tea menu, which was exciting to see. 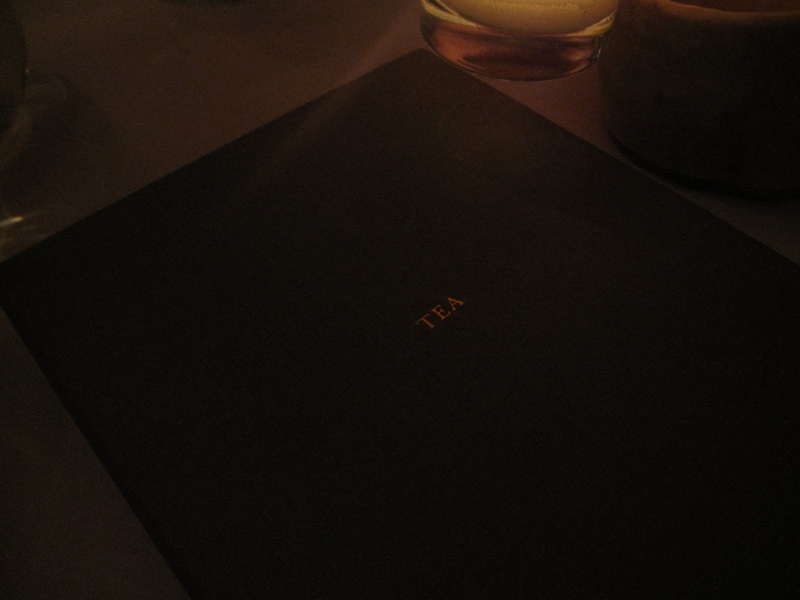 The menu didn't state if the tea was a particular brand, so I asked. It was from SerendipiTEA. I've had this brand at home, so paying $6 for a pot seemed a little much, but in line with similar restaurants at this price point. I also know it is a fairly good quality tea. Besides, we were out for a special occasion, and I wanted a nice cup of tea! They had a black tea that I hadn't tried before, so I ordered it. The tea they prepared was fine, but it was a tiny bit on the weak side for me. Like most upscale restaurants, the leaves were removed from the pot before serving, and they were not included on the side. I wished that I could have steeped the tea for another 30 seconds or so. I'm sure if I had asked one of the servers, they would have brought fresh leaves for me, but that's not really the point. This restaurant was on the right track with their tea service. I just wish it would have been more interactive for me. I guess the conclusion is just because a restaurant is 'fancy' it doesn't mean that their tea is better. It's possible that they do have quality leaves, but this gets lost if the tea is not prepared properly. Although when I am out and do get a good cup, it makes the meal all the more enjoyable whether I am at a local Thai joint, or 4 star restaurant. Tea lovers, what do you usually do? Do you have any solutions for all of the restaurants out there? I've had many of these same thoughts and feelings myself. It particularly strikes me when I eat at a relatively fancy restaurant that puts a great deal of energy into the quality and presentation of the food, and which serves high-quality coffee, but then brings out tea bags that you'd expect to find in food service. At the same time, I'm occasionally impressed with what I'm served. A local Vietnamese restaurant here in Newark, Delaware, called Little Saigon, pretty much a hole in the wall, serves outstanding whole-leaf tea and has a selection of several different types of tea. I think most restaurants would gain so much by serving better tea. And it's so easy! Tea is so inexpensive relative to other restaurant costs, and brewing it properly is easier than preparing a lot of other drinks. For the record, I was at the 4-star restaurant in question for the 2nd flush incident. There was nothing sheepish about her response to the server!